In the gorgeous mountain range of Pikes Peak in Colorado Springs, Colorado a savvy homeowner decided to add to his piece of paradise by adding an Outdoor Kitchen to his home. When contemplating this addition he sought the advice of a professional which could help him decide on the best materials to use so that his Outdoor Kitchen could handle the temperature and weather cycles of Colorado. Tom Stuart of Stuart Remodeling advised the Colorado Springs homeowner to compliment the brick structure of his home and to build the walls of his outdoor kitchen with the same material. Stuart Remodeling installed the brick wall with true craftsmanship. 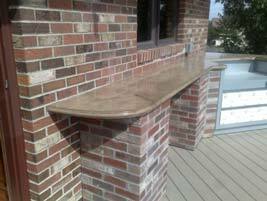 The time came to decide on an outdoor kitchen concrete countertop that could match the beauty of the hand placed brick. After researching online the homeowner decided on the organic handcrafted look of concrete countertops. In his research of multiple companies which offer concrete countertop building materials they choose the Xtreme Series Concrete Countertop Mix of hybrid glass fiber reinforced concrete. To learn more they went to the storefront of Two Sisters Decorative Concrete Supply in Colorado Springs. At this concrete supply center he was educated further on the Hybrid GFRC material and the limitless design and color opportunities that it offered. They choose to go with a lightweight GFRC concrete countertop that had a 1.5 inch profile edge of “Classic Rail”. With the profile chosen it was time to decide upon the color, texture, and design. Utilizing the SureCrete concrete countertop color chart, they choose Taupe from the 30 standard colors. The “Veining” texture by the Xtreme Series PreCast mix was the desired texture. 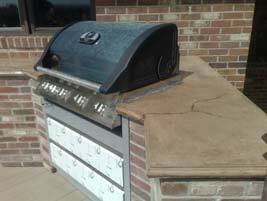 Finally the concrete countertop for their outdoor kitchen had one last decision, a high gloss or matte finish. The Hi-Gloss sheen was desired and the time came to finally create the one-of-a-kind countertop which had been customized to the homeowner’s specifications. The concrete countertop was templated, precasted, and sealed off site to ensure that the project site was left in a clean state. Most countertops built with the Xtreme Series Technology have a 5-7 day turnaround from the time of casting. After the sealant reached full hardness, the 25 sq. ft. countertop was taken to the Colorado Springs home and installed on top of the beautiful brick wall system, putting the final touch on this project. For more information on how outdoor kitchen concrete countertops are made or the colors, textures, and profiles available feel free to contact Two Sisters Decorative Concrete Supply or Stuart Remodeling or a Surecrete Product Specialist.